(c) 2009 by Darek Mihocka, founder, Emulators.com. A quick chime-in to say Happy New Year to readers of this blog and wrap up some open issues I promised to touch on last winter. I've been insanely busy at the Intel day job. In fact 2009 was the year since 2003 that I actually worked on the same project for the whole year. At Microsoft life consistent of frequent corporate re-orgs and projects being shuffled between divisions and the even revolving door of changing management. It has been nice to actually work with the same group of people for a whole year, despite the time to come up for air. I took only week of vacation this whole year (in September, to catch a couple of Metallica concerts and visit the Kentucky Bourbon Festival, of course) and only had time so far this year only to crank out this posting on the simple way to upgrade a Windows XP Pro machine up to Windows 7 Pro without forcing a clean install. When Microsoft tells you to do a clean install it's usually because they don't want the support hassle. <grin> But it turns out to be quite possible and I have now upgraded quite a number of my XP machines up to Windows 7 without losing any data or applications. Y2K did not kill us and the VAIO U750 lives. Time for a new blog! Full disclosure: As always, I put my money where my mouth is. The companies and products I am about to discuss (namely Microsoft, Intel, Sun, Clearwire) are all companies that I own heaps of stock in. If you think Windows 7 was a long time coming, I remember first hearing about WiMAX in March 2005 after Microsoft sent me down to San Francisco for the Spring 2005 Intel Developer Forum. Back then the Intel hype machine was saying how metropolitan-wide wireless internet would be hitting major cities within a year. 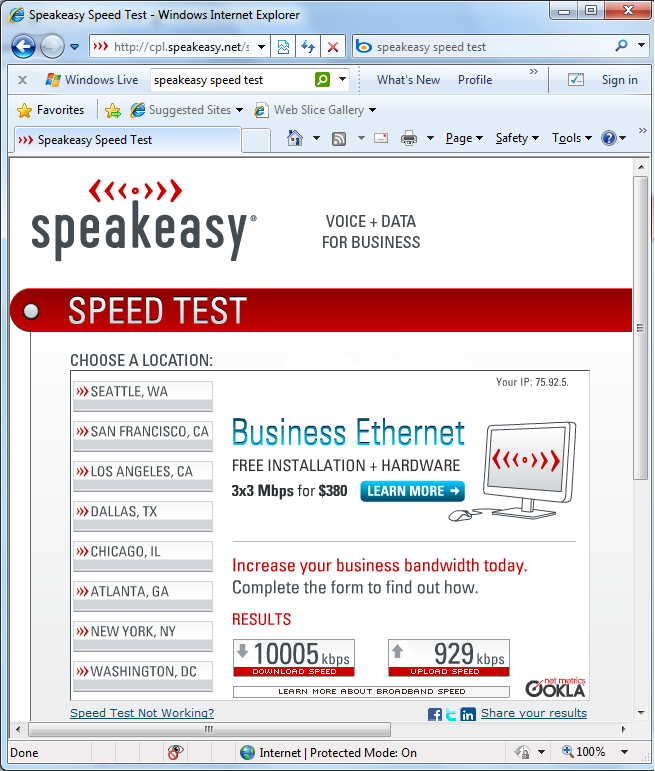 One such company that now offers WiMAX service is Clearwire (http://www.clearwire.com/) based here in the Seattle area. And indeed, by summer of 2007 Clearwire stores here were selling wireless broadband modems and cards. I was one of their first customers and have enjoyed having portable internet access anywhere within about a 20-mile radius of downtown Seattle. But that service, which maxed out at about 2 megabits-per-second, was not the "4G" WiMAX. That was always promised as "coming soon". True WiMAX finally rolled out this past January in Portland, Oregon. Being a frequent business traveler to Portland this past year I purchased one of these new devices from Clearwire, which now brands them under the shorter name "Clear" (http://www.clear.com/). Pictured below are the various Clearwire and Clear devices. The old PCMCIA card and PC Card, similar to many 3G cards that cell phone providers offer, are now replaced by the smaller and faster USB-based WiMAX dongles. In September, I was driving from Seattle to San Jose for work and much of the way down I-5 I was able to pick up Clearwire/Clear connectivity using a combination of the PCMCIA card and the USB dongle. In Portland, in Salem, in Eugene, in Grant's Pass, in Redding. I kept up with email, even participated in Live Meeting streaming presentations. No hunting for wi-fi hotspots, no paying coffee shop access fees to AT&T or T-Mobile, no security concern about open coffee shop hotspots. Shortly thereafter, my WiMAX equipment started picking up a signal here in Seattle a well, so for about the past three months I have driving around Seattle and using my computer all over Seattle over a nice faster megabyte-per-second wireless broadband connection. And having recently been to Chicago and Las Vegas, it was great to have my WiMAX service in those cities as well. No roaming fees, because the Clear hardware you purchase in Seattle or Portland works in those cities as well. It is like having your home DSL modem with you at all times. I will state the obvious: if you think texting is bad for driving, having full internet access while driving at highway speeds is going to be the death of us all! Once car makers start delivering built-in 4G connectivity in cars, we're all doomed. And it is coming. But for me personally, the availability of the Clearwire and specifically WiMAX service in so many cities now is the big technological breakthrough of 2009, even if almost five years after it was first promised. It is as significant an improvement to my internet connectivity as switching from dial-up to broadband was about a decade ago. Ironically, the one place that is still not served by Clearwire... the place I first heard about it: the San Francisco bay area. Oh this has a been a surprising year for Apple. From their pullout at Macworld to being beaten to the punch by Windows 7, this year was all about Windows 7. Right from the start in January when Microsoft announced the free Windows 7 beta until today, when Windows 7 installs and runs well on small netbook computers that Windows Vista and Mac OS X Snow Leopard do not, to all the millions of Windows 7 sales in between. Although not available to the public, Apple did beta test Snow Leopard for many months via it's Apple Developer Connection web site. I remember download the build in early May and having it just completely not work on my Mac Pro. Not a fluke apparently, based on the numerous compatibility report that came out after the launch of Snow Leopard, and the fact that Apple had to rush two massive service packs, 10.6.1 and 10.6.2, hundreds of megabytes in size, out the door within weeks. As is customary with Apple's short support windows, Snow Leopard already drops native PowerPC support (so forget installing on a nice dual-core PowerMac G5 that otherwise runs 64-bit Linux distributions quite nicely, it drops 64-bit support on machines such as my Mac Pro which are barely three years old (yet which runs 64-bit Windows 7 just nicely), and pretty much requires you to buy top of the line new Apple hardware. Not a good idea in this economy. Much as Windows 7 is just a leaner Windows Vista with faster boot time and better stability, Snow Leopard was supposed to be that to Leopard. And it yet it failed. There is little to compel a Mac user to upgrade from 10.5 to 10.6. In fact, my three year old quad-core Mac Pro? The one that had trouble even with the Snow Leopard betas? Even the official Snow Leopard DVD refuses to upgrade the Mac OS X 10.5 Leopard on my Mac Pro. it just gives an error that the drive can't be installed to, even though I'm booting Leopard from the primary drive which has over 200 gigabytes of free space showing in Finder. Upgrading a PC to Windows 7 has been the exact opposite experience. I briefly touch on the Windows 7 beta in my last posting in January, and I have yet to have Windows 7 fail to install on a PC built since 2001 (back when Apple's top of the line Mac was a PowerPC G4). If you purchased a Mac in the first half of this decade preloaded with Mac OS X (versions 10.0 10.1 10.2 or so), you have ZERO chance of upgrading that Mac to Snow Leopard. Whereas if you purchased a PC in the first half of this decade preloaded with Windows XP, you have a very good chance of upgrading that PC to Windows 7. I've now done this upgrade numerous times, even on PCs that Windows Vista was too fat and bloated to fit on. I will stop short of accusing Apple of false advertising, but it is obvious to anybody with half a brain that the pretentious and arrogant Mac ads on television these days making fun of Windows 7 simply do not live up to the reality of the Mac OS and Windows experience as it stands at the end of 2009. And a little fact most people seem to forget. Windows 7 Ultimate Edition includes a fully licensed Windows XP SP3 virtual machine, similar to Apple's old "Classic mode", which allows you to run 16-bit and 32-bit legacy applications in a window with shared disk drive and clipboard support with the Windows 7 host. Good luck running legacy Mac applications in Snow Leopard. Game over Snow Leopard. I am pleased to report that my favorite little computer from 2004, the Sony VAIO U750, does upgrade to Windows 7 just fine, and runs very nicely with the Clear service as well. Scroll down for a photo of one of the oldest tablet PCs still running great after more than 5 years of service. Speaking of upgrading old hardware, I went into all the details a month ago on the first of this month's full moons to explain how to install Windows 7 on an old PC, so click the link below and enjoy the read. And by the way, I still have some packages of Windows Vista or Windows 7 to give away as per the directions in that tutorial. One other thing that Microsoft did pull off this year worth noting is the release of a truly free anti-virus product called Microsoft Security Essentials, available from http://www.microsoft.com/security_essentials/. It is not that same OneCare subscription nonsense they tried a few years ago, and none of the Symantec or McAfee scareware tactics that urge you to upgrade to a paid subscription after sneaking in a supposed "free" anti-virus product on your machine. Delete Symantec. Delete McAfee. Just install Security Essentials. Bochs 2.4 (and 2.4.1 and 2.4.2) Released! Bar none, there is no better open source x86 PC reference simulator than Bochs. It just works beautifully, and since I took this screen shot way back in April in a pre-release build of Bochs 2.4, Bochs has been upgraded with official 2.4, 2.4.1, and 2.4.2 releases (http://bochs.sourceforge.net/) which also support the 64-bit versions of Windows 7 and various 64-bit Linux distributions. So if you have not upgraded your Bochs, do so. 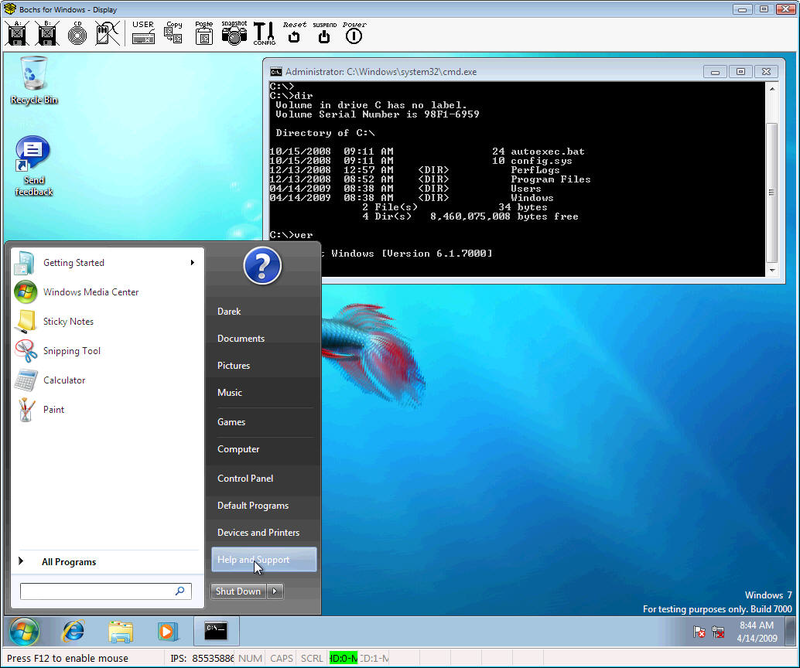 The latest versions simulates a dual-core 64-bit Windows 7 machine very nicely. Stanislav has been doing his usual amazing work to fix bugs and improve the compatibility this past year. I myself have not been entirely devoid of programming time this year. I have some edits for Bochs which improve the speed by about another 10% over the official release. But I will have to address those techniques in some future posting when I had more time and can focus on detailed technical issues again. Hint: the lazy flags code in Bochs is still not as lazy or efficient as the implementation I have blogged about in past postings. Can you figure out the optimization? The big virtualization news this year, as I touched on in my January posting, was the ongoing supremacy of the Sun VirtualBox product over VMware Workstation. Sun has been on an absolute tear, posting practically monthly updates of VirtualBox to the http://www.virtualbox.org/ web site. During the course of 2009, the Virtual Box product added multi-core guest VM support, memory over-commit, processor over-commit, 3D video acceleration, and in the most recent VirtualBox 3.1 release a few weeks ago, even started adding support for my favourite VM topic: Live Migration. After well over a year of not major updates, VMware finally released VMWare Workstation 7.0 late in 2009, which now finally adds 4 guest processor support. VMware Workstation 6.5 had sadly been limited to just 2 guest processors, sadly lacking today in the day of 8-core and 16-core workstations. But having upgraded to VMWare Workstation 7.0 and playing around with it recently, it just doesn't have anything of interest to me that I don't already have in VirtualBox. My big bone to pick with VMware, as it was last year, is the fact that for those of use who use both Mac OS and Windows and do use Boot Camp to dual-boot between the two on our Macs, VMware demands two software licenses for the same machine - a $189 VMware Workstation license for the Windows side, and then an additional cost to purchase effectively the same product for Mac OS in the form of VMware Fusion. And then yet another license if I boot into Linux. Beyond the clear technical superiority that VirtualBox offers today, the fact that VirtualBox is free and permits you to host the exact same virtual machine disk images on Windows, on Mac OS X, and on Linux, on the same machine, is a huge plus for me. And since VirtualBox imports VMware .VMDK disk images, I have successfully moved over a number of my Linux virtual machines from VMware to VirtualBox now and run them under all three host environments - Windows 7, Mac OS X, and Linux. Time for the founder-less VMware to stop with the marketing hyper and get back into good old core hypervisor technology development again. And as in 2008 when it failed to impress me then, Microsoft really failed to make any headway with Hyper-V in 2009. Talk about an unflattering editorial! Going into 2010, the virtualization game is truly owned by VirtualBox. Congratulations to Sun/Oracle. My next few top items of 2009 are hardware devices, so I'll cover them together. First, the Microsoft Arc Mouse. A mouse you ask?!? Yes, a measly 40 dollar mouse makes my list this year. I've tried previous wireless mouse from Microsoft and Logitech before, and none compares to the Arc Mouse. The Arc Mouse is light, very precise (if replacing an older mouse you will find you need to turn down the sensitivity of the mouse pointer), and best of all, it just works with both Windows and Mac OS X. I've used it with Dell and Acer notebooks, my iMac, Mac Pro, and even through KVM switches. Best wireless mouse, period. Next item, Seagate's LP 5900 rpm hard disks. Yes, 5900 rpm, not 5400, not 7200. Seagate has created a new category of hard disk, which is brands LP for "Low Power", that delivers quieter performance than a 7200 rpm drive, a large 32 megabyte disk cache to compensate for the slower rotational speed, and a ridiculous under-$100 per terabyte price. When these first came out a few months ago I picked up the 1.5 terabyte versions for 115 dollars, which I have since seen on sale below 100 dollars. The drives are great. I have upgraded four of my PCs to these drives (either from smaller drives or comparable 7200 rpm drives) and can confirm that they are in fact quiet and run cool. The selling point of these drives is that they consume roughly 6 watts, about half of a typical hard disk. This in turn means less heat, less cooling required, lower chance of a dead drive. Next item: the Bluray capable Atom machines. Last year I told you about the excellent little Shuttle X27 Atom barebones machine. It did everything as a settop box but support Bluray, which in itself is not a bad thing. The Shuttle X27 makes for an excellent near-silent Windows 7 email and web surfing computer for the bedroom of as Windows Media Center set-top box for your big screen television. A Shuttle X27 with a silent solid-state drive is what I keep in my bedroom as a matter of fact; it is quieter than a notebook computer. The board offers two DIMM slots and supports putting in up to 4 gigabytes of RAM, great for running 64-bit edition of Windows 7. Combined with a small form factor case, the board fits neatly with an LG HD-DVD/Bluray drive, which can be picked up these days for about 100 dollars. As you can see from the back of the machine, the board also features built-in 802.11n wireless port to which you can attach an external antenna. This makes the board ideal as a remote set-top box, as you do not have to spend an additional 50 dollars on a USB wireless dongle. That is the Shuttle X27 sitting on top of the Zotac machine, but what is that cute little tablet PC next to them? That bring me to my next item, what I believe to be the world's first touch screen netbook, the 399 dollar 2goPC. This is the vision of the small durable inexpensive tablet PC that the OLCP hinted at a couple of years ago. The 2goPC I purchased (well, three of them that I've purchased so far) includes pre-installed Windows XP, 2 gigabytes of RAM, 60 gigabyte hard disk, built-in 802.11g, 5 to 6 hour battery life, and of course, that screen. That beautiful beautiful touch screen. The screen swivels around, allowing the 2goPC to be used a standard clam-shell netbook. Or flip the screen over and you now have a tablet PC. Must like an iPhone, the 2goPC senses its orientation and rotates the screen accordingly. I've upgraded mine to Windows 7 and used one machine at the gym to watch pre-recorded television in Windows 7 Media Center and iTunes video podcasts. Another one is my travel machine, which when combined with the Clear dongle, makes for a great email machine to have around town. I've had the Revo for about three weeks now (they appeared at Fry's in early December) and have already upgraded the pre-installed Windows XP to Windows 7 just fine. Swapping out the hard disk temporarily I can also report that I had no problem installing Mac OS X Snow Leopard on it! Better luck than on my real Mac Pro, heh. My friend Ed pointed me at the My Dell Mini web site http://www.mydellmini.com/ which is a great resource for interesting things you can do with Acer Aspire and Dell Mini type netbook computers. Hint: go to this web site: http://www.psystar.com/rebel_efi and download RebelEFI, which will permit you to install Mac OS X on a larger variety of Windows PCs. Considering that is also comes bundled with a keyboard and mouse, the Revo is a great little all-in-one out-of-the-box starter PC. The parallels to a Mac Mini are undeniable - this is the "PC Mini" set-tob box - and at 189 dollars including Windows XP and HDMI output, is about the least expensive complete PC you can buy today. Comparable to PC specifications at the first part of this decade, the Revo delivers the memory, disk space, and computing power of a top-of-the-line 4000 dollar Pentium 4 machine from just nine years ago. A 20-to-1 price reduction with comparable size and power consumption reduction in less than a decade! For those willing to spend a few dollars more and put it up into the 400 dollar range, the Zotac board I described makes for a terrific little all-purpose home theater PC (HTPC). With Bluray drives selling for as low as about 80 dollars today and the terabyte hard drives also dropping below 100 dollars, the complete HTPC with Bluray and 802.11n internet connectivity is literally about a 400 dollar project - and is practically silent. That wraps up my summary new hardware for 2009. In just one year, we've gone from the excellent Shuttle X27 and Acer Aspire One netbooks to the even better 2goPC tablet netbook and Revo and Zotac ION systems. Which brings me to one more software item. For how many desktop PCs and netbooks and set-top boxes I've built this year, upgraded to Windows 7, or moved to larger hard drives, life would have been far more difficult it had not been for a product called HDClone 3.8 from Miray Software in Germany. HDClone is just the best disk imaging and backup software I've ever used. It puts Norton Ghost to shame. Purchase the Standard Edition for home use, well worth the money. As I type this counting down the hours left in 2009, I think back to where I was exactly 10 years ago today, December 31 1999. I was in Sydney Australia visiting my friend Simon watching the big festivities at the Harbour Bridge. Most PC hard drives were in the low digit gigabytes. CPU processor speed was just a tad below a gigahertz. Most of us had not yet upgraded to flat screen televisions or HDTV. And Y2K was going to kill us! Which is why I fled to Australia in late 1999, rented a motorcycle in Melbourne, and trekked through the desert awaiting the Y2K apocalypse that never happened. The best thing about Y2K is that ten years after the supposed end of the world, we are all still around and all these amazing products have come out in those past 10 years - the VAIO, netbooks, HDTV, WiMAX, and holy cow, have you seen it, Avatar! In fact, 2010 is a milestone year for me, marking the 10-, 20-, and 30-year anniversaries of some very important events that have shaped my life and my career. 30 years ago in 1980 my school received its first computer lab and I had the opportunity to write my very first computer program. 20 years ago in 1990 I earned my Engineering degree and went to work full time for Microsoft where for almost two decades I worked as a developer on some of the most widely used computer software in the world. 10 years ago, returning from Australia to watch the Y2K hype fizzle and the dot-com bubble burst, I began blogging about all that I saw wrong in this industry, from the idiotic and unnecessary Windows Millennium release to the bloated initial Mac OS X release, to what ultimately led up to me going to work for Intel eight years later - my criticism of the Pentium 4 processor. Between my posts to the Darek's Secrets blog, my Pentium 4:In Depth analysis, and this NO EXECUTE! blog, I have tried to explain the gory low-level technical details of computers in an effort to debunk and demystify the industry that has been a major part of my life for 30 years now. And much of what I've had to get off my chest I have said now over the past ten years. And I am grateful that people have read my postings and taken into consideration the things I have had to say. As I was working on this Top Ten List of 2009 I realized that 2010 would be a perfect milestone year to devote a regular blog to that spirit; to look back not just at the technology of the past year but rather of the past 30 years. There, every Tuesday, or as many Tuesdays as my work schedule permits me to actually enjoy a few hours off on weekends to prepare a post by Tuesday, I will look back at some piece of technology since 1980. Perhaps a computer model, a microprocessor, an operating system, an application, or a peripheral. I have been collecting this stuff for 30 years and certainly have no shortage of the original hardware and software products in my house to discuss. I will pick thirty of the most interesting products that I find and post about them on different Tuesdays in 2010. Thus then blog name: Thirty Tuesdays. Happy New Year 2010! See you on Tuesdays.